So after first trying to make a Nutella Christmas Tree, which we loved, I decided I cannot keep making that all year round as I love Christmas cooking and making things all special for Christmas. So after trying out the sun shape in a ham and cheese version first, I then immediately went back into the kitchen and made this Nutella version. This was delicious, absolutely delicious. The kids loved pulling off the sun ends and eating them, it was a fun and tasty snack to make them. Super easy to make also, which is always a bonus for me, I do love simple cooking. Now you can trim the pastry to make it round, more sun shape, but I find that just a waste of pastry and in all honesty, I'm okay with imperfection. Now the recipe is a guide, I really don't measure anything except the pastry. I put on as much Nutella as I like, sprinkle on the chocolate and almond meal without measuring. This is supposed to be simple. If you don't have chocolate at home, I even sprinkled on 2 tablespoons of Milo instead. If you are having kids over, like I had my nieces, and you want something that looks and tastes great, give this a go, it is delicious. Line a baking tray with a sheet of baking paper. Place 1 sheet of pastry on the baking paper. 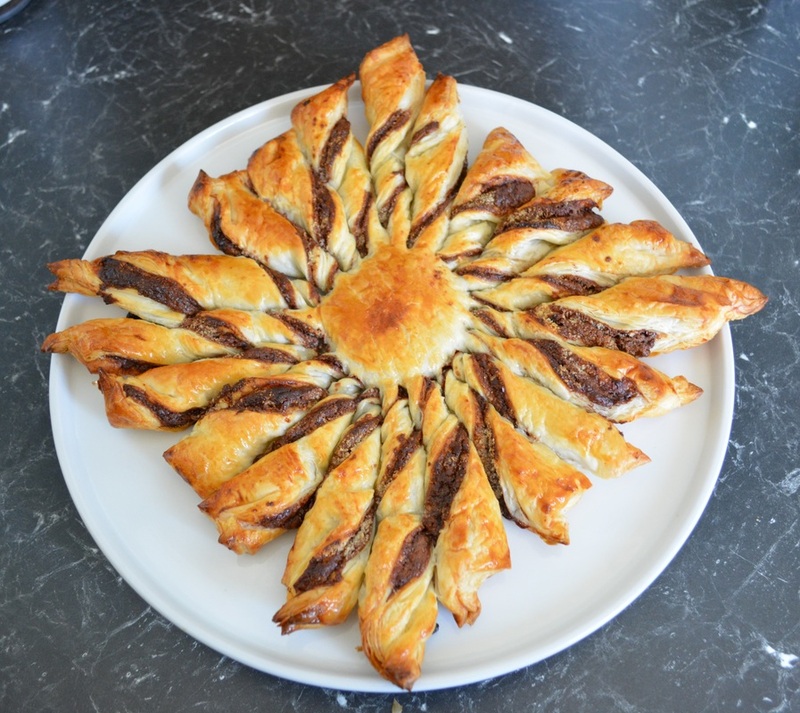 Spread Nutella all over the pastry. Sprinkle over the chopped chocolate and then the almond meal. Brush the remaining pastry sheet on one side with egg. Place the egg side down over the filling, pressing the edges down slightly to seal. Now place a drinking glass in the centre of the pastry, don't press it down, you don't want to cut the pastry, just mark it. 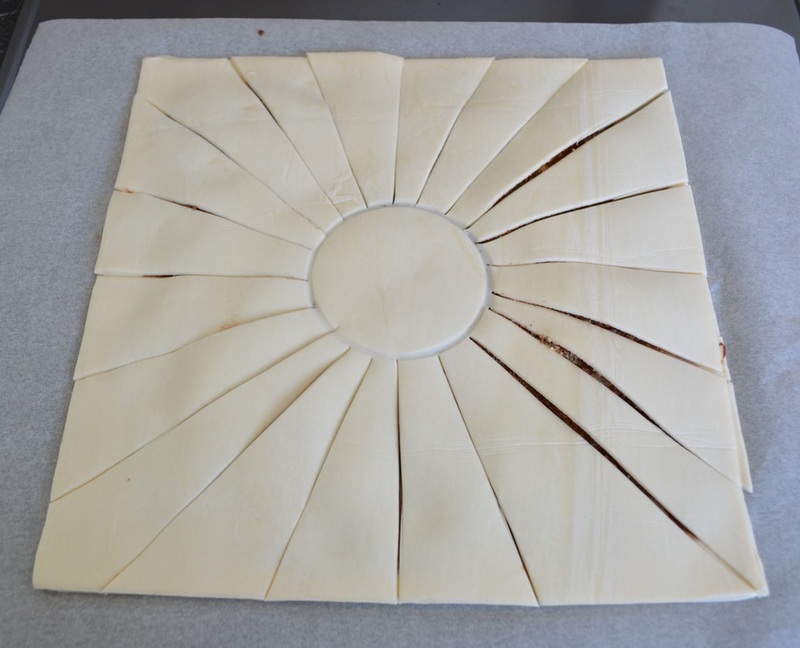 Now cut out from the glass to the edges, making sure you cut through to the bottom pastry sheet. Make the slices thinner, rather than thicker. Now take each strip and gently twirl them, press the ends down a little. Brush all over with beaten egg. Bake for 20-23 minutes or until browned and puffed. 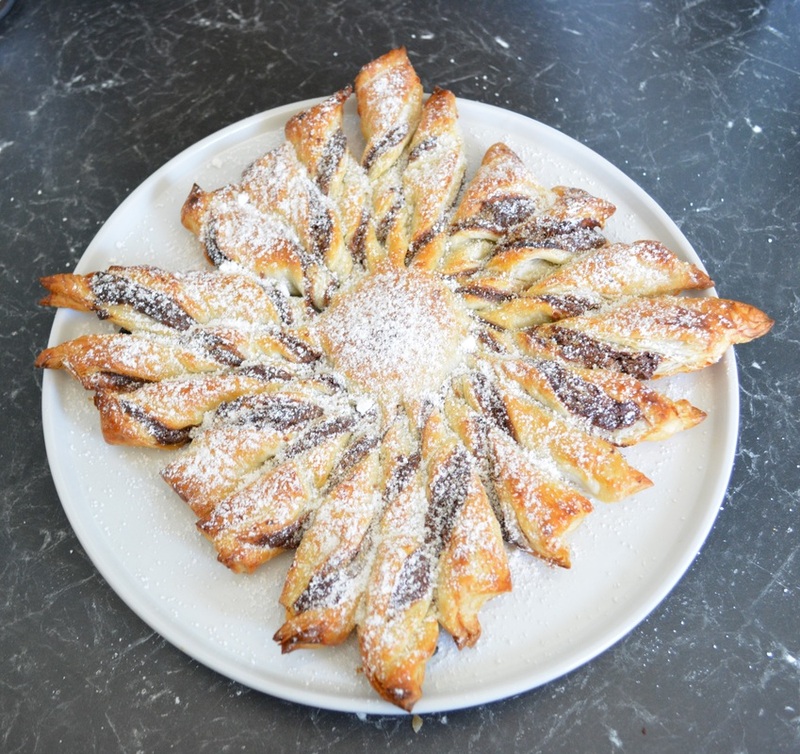 Carefully place onto a serving plate and dust with icing sugar. Serve hot, or at room temperature, but it is better hot. Remember just let your kids or guests tear the strips off, it is a fun way to eat it.